Let us first look at some of the traditions and verses on the subject. A Muslim who practises the ‘ibadah of Allah in a special way. He regularly performs his ‘ibadat without committing a sin because he has succeeded in freeing himself from the chief causes of sin. A Muslim who Allah takes under His Care as He says in the Quran, “And He embraces (yatawalla) the pious (salihin).” [al-A’raf, v. 166] This verse is usually understood to mean that Allah protects them from falling into sin. As a result scholars say, a Nabi is sinless (ma’sum) and a waliy is protected (mahfudh) from sin. One of the important points to note in these quotations is the utter and complete respect shown to the shari’ah. Authentic tasawwuf has everything to do with the shari’ah. Insinuations to the contrary one sometimes hear coming from the ignorant or widely held by earlier orientalist opinion, that Sufism teaches one to “transcend” the law are simply mistaken and uninformed. There is no tasawwuf without the shari’ah. One of the great features of Islam is that in addition to it’s function as a code of law the shari’ah is also the indispensable means to enter the Divine Presence. The salah, for example, we should see as the Divinely ordained key and instrument through which we “travel” to His Presence. The Nabi, may Allah’s peace and blessings be upon him, is reported to have said, “The salah is the mi’raj of the Muslim”. We should note the very important comparison the Nabi, may Allah’s peace and blessings be upon him, is making here. Lets think through this point for minute. The salah is the great spiritual journey of a Muslim. Compared in this hadith to the great journey of the Nabi as he travelled from the Haram in Makkah to the Masjid al-Aqsa in Jerusalem up to regions of nearness and intimacy to Allah where even angels cannot go. This journey of the Nabi prefigures the eternal quest of the travelers on the road of tasawwuf and in terms of this hadith should be the quest of every Muslim. Naturally ordinary men and women like ourselves cannot travel to Allah both physically and spiritually as the Nabi did. The point is that the salah is a gift from Allah and his Nabi to every Muslim and is the means to achieve a unique and blessed nearness and intimacy with Allah, the Most High, similar to what the Nabi experienced on that night. Similar remarks can be made of the entire shari’ah. In a hadith quoted in a previous essay the Nabi, may Allah’s peace and blessings be upon him, reported that Allah, the Most High, said, ” There is nothing better (as a means) for my slave to come closer to me than continuous observance of all I have made obligatory (ma iftaradtu ‘alayhi) on him”. One important point I want to make here is we have to remember that salah, fasting, haj, and zakah are not the only obligations (faraid) in Islam. Some of the other very important obligations in Islam, are for example, correct behaviour towards one’s wife, children and neighbours; justice and fairness in one’s business dealings; justice and fairness if we hold the reigns of power in a country; bravery on the battlefield against the enemies of Islam; purity of mind and the absence of jealousy, envy, hatred, arrogance and insincerity and so forth. The shari’ah deals with all of these matters in great detail. The basic principle in all of this is, that Allah will admit us into His Presence and allow us to enjoy the great peace of intimacy with Him if, and only if, we fully implement the shari’ah in our lives. In addition to the obligations (fards), all the superogatory wont (sunnah) of the Nabi and all the etiquette (aadaab) of the din shari’ah should be imlemented. 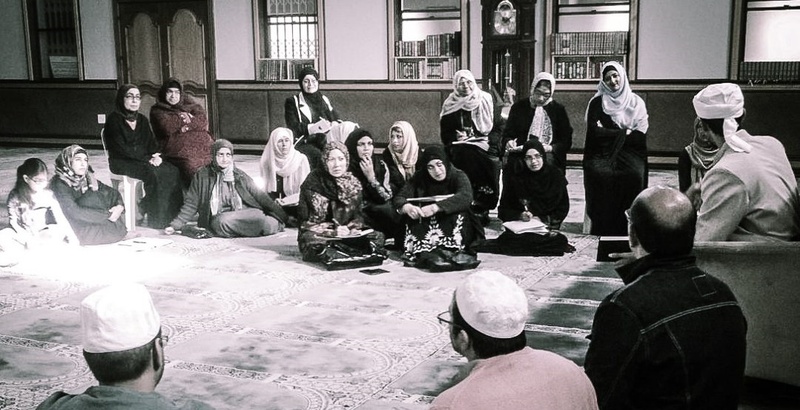 Listen to this story of one of the foremost Imams of our din. Abu Yazid al-Bistami once went to see someone described as a waliy by his acquaintances and students. When he arrived at the “waliy’s” masjid he sat down and waited for him to finish-up and leave. As this man left the masjid he spat, not outside the masjid but inside. Ba Yazid got up and left without greeting him. Naturally this caused a stir since Ba Yazid was a particularly prominent visitor, well known in the Muslim world at the time for both his spiritual status and his scholarship. People excitedly enquired why he did this obvious public snubbing of the man. Then Ba Yazid said, “This man cannot be trusted with a single adab of the aadaab of the shari’ah, so how can he be trusted with the secrets of Allah? “. The saint (waliy) is at once near (qarib) to Allah and drawn near (muqarrab) to Him. He comes closer to Allah through his own efforts in observing the shari’ah, and Allah, the Most High, in turn, assists, protects and draws the saint close to Him. Abu Hurairah, may Allah be satisfied wit him, narrates that the Messenger, may the peace and blessings of Allah be upon him, said, Allah says, ” I am with the thought of my slave, if he remembers Me by himself I remember him by Myself, and if he remembers Me in a group I remember him in a group better (than his), and if he comes close to Me the length of a hand I draw close to him the length of a fore-arm, and if he draws close to me the length of a fore-arm I draw near to him the length an arm, and if he comes to me walking I come to him like a wind”, in another narration ” I am with him if he remembers Me”. Firstly, when we perform our ‘ibadah we ought to do so with the utmost purity of thought (husn dhann) and expectation of acceptance from Allah. Indeed purity of thought itself is an ‘ibadah. Pure thought towards Allah (husn dhann) also implies complete acceptance of His Will. The aspirant has to work hard to remove all traces of sublimated anger towards Him. Allah gives to others and He withholds from us. Dissatisfaction with the Will of Allah and indeed anger towards Him is the source of envy. And secondly, since we are sitting in the Presence of Allah and He is with us, we have to observe the adab of maximum concentration on Him. If this is difficult or we cannot focus and concentrate with our whole being on Allah during our ‘ibadah we are required either to train ourselves or seek out someone who can train us to achieve that. Nearness (qurb) and the station of sainthood (wilayah) are inextricably connected. Both of which should be the hope and objective of every Muslim. According to this tradition, Allah comes to us “faster” and with greater ‘vigour” than we to Him. One important conclusion we can deduce from this tradition is that love and respect for the awliyah is obligatory (wajib). And it is prohibited (haram) to dislike or injure the awliyah. There is no heavier punishment than Divine War. A punishment of this magnitude is clear evidence of obligation and prohibition. Allah declares war against the one who injures the awaliyah either by word or deed. Therefore injury to them is prohibited and the converse, respect and love for them, is an obligation. They represent the best of Islam and they embody the shari’ah in all its fullness. And consequently they are the beloved of Allah and His chosen slaves. Abu Turab Nakhshabi expressed a very important point when he said, ” If the heart turns against Allah it is accompanied by criticism and dislike of the awliyah” [Narrated by Imam Qushairi]. Every Muslim who fears Allah and cares for his din should be wary of this. The criticism and sometimes open hostility against the great scholars and spiritual masters and above all the against the Sahabah, may Allah be pleased with all of them, one hears from certain quarters is cause for concern. Imam Abu Hanifah, Imam Shafi’i, Sayyid Abdul Qadir Jailani, Imam Ghazali and many others, if they are not awliyah of Allah, who is? Scholarly critique of their opinions is one thing, but begrudging and belittling them is an entirely different thing. The often inexplicable aggression and hatred against some of our own righteous scholars falls into the exact same category. According to Abu Turab these are symptoms of a deeper and more dangerous tendency. The reason for this hate and hostility has to be looked for in the hearts of the critics rather than in the people they are criticizing. Another basic point in this tradition is that the path to the station of nearness is the shari’ah. ” The best way to attain nearness to Me is to practice the obligations (ma iftaradtuhu alayhi)” and further in the tradition “… and My slave does not cease to draw nearer to Me by going beyond the obligations (nawafil) until I love him…”. The path to this station of nearness and sainthood are the obligations (fara’id) and the supererogatory deeds (nawafil) both of which are exhaustively dealt with in the shari’ah. So shari’ah is the teachings, tariqah is the practice of those teachings and nearness is the objective. The beginning of the path is struggle (mujahadah) against the self to implement the shari’ah and the end is vision (mushahadah) of the Majesty and Beauty of Allah in the station of nearness. The first step anyone interested in following the path of tasawwuf should take is therefore to make the necessary effort to study the shari’ah. I have also indicated in an earlier discussion that salah, fasting and hadj are not the only fards or obligations in Islam. The other important social and ethical teachings are just as crucial. In this regard one of the best books to study and digest is the riyad as-salihin of Imam Nawawi. His death is hastened, his mourners few, his estate of little worth.